Victoria Langford started running, hiding, and trying to escape from an abusive relationship and keep her daughter safe from harm. She kept moving but her predator kept finding her until she ran out of gas and got a job in Texas working for Joshua Cain on the Iron River Ranch under the guise of Tory Ford. Josh did not want her and saw trouble with a capital T written all over her, but something about this feisty woman made him say yes she could be a ranch hand. Josh figured it would be a day and she would call it quits, but morning after morning she got up before the sun and did the work he requested. So now what is Josh going to do with her and the problems that seem to be hitting them from both directions? Tory proves to be a hard worker and Josh expands her responsibilities and helps find some help for her daughter so that Tory can even help him with an unmanageable horse that he is desperate to get under control. The only person that can get close to Star is Tory and the skill set she shows for helping him with the modernization and promotion of the ranch as well as caring for his animals is more than making up for the baggage she carries around with her. Josh gets bits and pieces from her of the background she is hiding from and swears to her nothing will ever harm her or her daughter in anyway – so a deal is struck and the work on the ranch continues. The only problem is the almost desperate attraction between the two of them that they are tamping down with every ounce of self-control and the battle goes well by day but the two surrender to their desires by night. As long as they remain professional all will be fine, but the line if very fine between professional and passionate when it comes to close quarters. When disaster comes in the manner of a fire the first reaction is Tory’s predator has found her, however it becomes clear the issues are against Josh and not only does he have someone with a grudge he has a terrorist from his military days leading a march of destruction against him and his fellow Marines. When one event gets under control another pops up and Tory with Josh are striking against problems from one part of the country to the next. For Tory it has become a problem keeping quiet and hidden but she knows with Josh by her side she is safe and when her past shows up everyone will be able to handle it. For Josh the problems are revealing themselves and his ability to utilize that military background proves that patience is what will wear your enemies down and eventually eliminate them. Kat Martin rocks the written word on every page with suspense, intrigue, and hot as lava rock romance every reader craves. Know ahead of time if you start a Kat Martin book there is not putting it down until you are done! Great book! Tory and Ivy wormed their way right into my heart and I was rooting for a “happy ending”. And Josh can be my hero anytime!!! And even Damon played his role to perfection, the mention of his name had my skin crawling. Such a outstanding trilogy – loved all the characters and having them back for the final book . 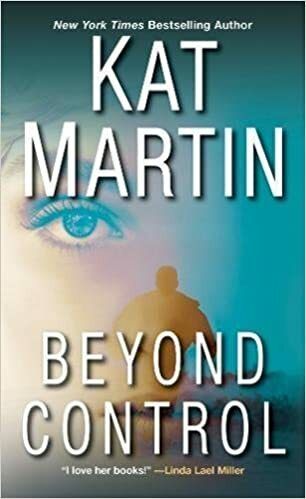 Kat Martin writes Romantic Suspense at its finest – her books are an auto-buy for me and I always love them. Another home run from Kat Martin. I’ve said it before and I’ll say it again but her historical American romances are like a combination of David Baldacci and Danielle Steele. She weaves an intricate web of suspense combined with steamy romance which makes her books very hard to put down. I wish this series wasn’t a trilogy.